Who wants to have a tea party! Tiny Tina is an unstable 13-year-old explosives expert who, along with her parents, was sold into slavery to become a test subject for Handsome Jack's mutation experiments. This event eventually led to the death of Tina's parents, and while she was able to escape this fate with the help of a grenade hidden in her dress, Tina has vowed revenge on the man who sold her and her family. Other than the fact that she got a glory shot in the Borderlands 2 "Wimoweh" trailer, that paragraph up there represents the sum total of what I know about Tiny Tina. Small little girl, lives in the desert, likes blowing things up. What more is there to know? Her blood type? Her favorite food? H-- Wait, what? The game does tell us her favorite food? And her least favorite food? Well dang, game, way to flesh out your world in small, ultimately unimportant but rewarding ways! Tiny Tina lives up to her name, being an utterly miniscule lass - the toy is barely over 6" tall, and the girl it represents is super, super scrawny. Living alone and having poor nutrition has taken its toll! She wears the same orange jumpsuit a lot of the dwellers in the wastelands favor, but that's peeking out from beneath a tattered brown dress that she may well have been wearing since she was a kid. There's a pink apron on the front with a cartoon bunny on it, and holes and stitches all around. Her shoes and socks are mismatched, and wildly so: on the right, she's wearing a white sock and a Mary Jane; on the left, she's got a pink knee-high sock with black stripes, and a clompy sneaker. To carry her belongings, she has a backpack with a pair of scissors tucked into it, a small gray satchel with a knife hidden in it and a bundle of dynamite on the side, and a fanny pack with a zipper. On her right arm she has a baggy sleeve that seems to be held on by three belts. Her hair is dirty and chunky, and she wears a Psycho Bandit mask on the side of her head, but it's too small even for her face, let alone a full-grown adult. The paint is a good attempt to approximate Borderlands' cel-shaded art style. 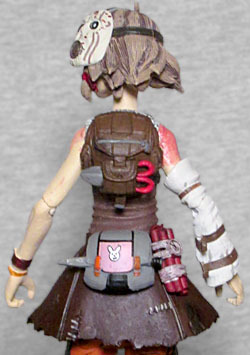 The back outlines are not overdone, having just enough of a presence to make the toy look right. She's painted extra-pink on her face and shoulders, suggesting a sunburn, but the rest of her skin is incredibly pale. An early glitch in the game gave Tina a lazy eye, but the developers liked it so much they left it in - this figure has both her eyes pointing in the same direction, but that would have been a fun variant. The pink on her shoulders is nearly the same as on her shirt and apron, but the only real "flaw" with the paint is that her right sock below the ankle is a darker color than her right sock above the ankle. McFarlane Toys is not known for its articulation; in fact, McFarlane Toys is known for "not" its articulation. Mikasa showed they were trying to get better at that, and Tiny Tina continues the trend. She has balljoints for the head, waist, wrists, hips and ankles, and swivel/hinge joints for the shoulders, elbows and knees. The swivel/hinge joints are still the not-very-well-designed ones with the big visible ratchets and exposed pins, and the hips go straight up into the trunk, so while they turn very nicely, they don't raise or extend. Still, in this case, we're willing to give Todd credit for trying. 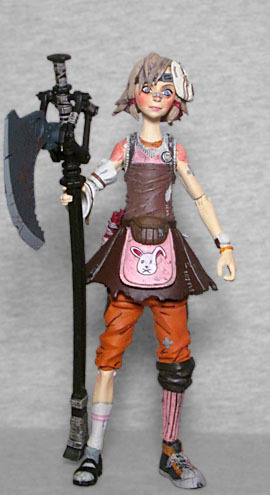 Tina is armed with an axe that's as big as she is. No kidding - discounting the little spike of hair on top of her head, she and her accessory are identical heights. It seems to be cobbled together from whatever junk she could find, including a car's jack. It's a bit too big to fit her hands, but the plastic is soft enough that you can pry them open and work it in there. The figure also includes a black display base, with the Borderlands logo on the front and a pebbly texture on top. There's a footpeg up there to help keep her standing. There are also three "Golden Keys" to unlock in-game loot, but that's only useful if you actually play the game. When NECA had the Borderlands license, they said that human characters just wouldn't sell; now McToys has it, and they're diving in with two humans right off the bat. 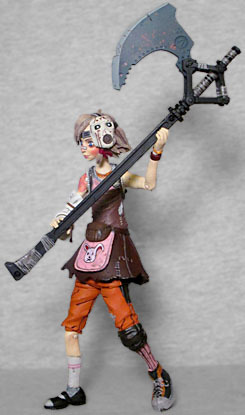 Luckily, Tiny Tina is a cool toy even if you haven't played the game.